This last week, we've had some awesome media coverage, some of which was totally unexpected. It's really exciting to feel the momentum build, and what started as merely a concept last year start to take shape. Super proud of my team in getting us to this point. GigaOm's Stacey Higginbotham named us one of 10 start-ups to watch in Austin for South by South West (SXSW) 2013. "TrustRadius: The stealthy startup pitches itself as Yelp for enterprises, and it has some local investors pretty excited. The idea is interesting, and the TrustRadius CEO Vinay Bhagat started Convio, an Austin startup that made software for the nonprofit sector. In 2010 Convio went public and was later acquired in 2012." Read more here. We were also featured in the Austin Business Journal, in a story by Christopher Calnan about Community and Collaboration companies. "TrustRadius, which launched last year, has been beta testing its model since November and plans to open it to the public in April. Its strategy is to give buyers of enterprise-level technology, such as software and servers, feedback from other business without any bias, CEO Vinay Bhagat said. Since analyst firms are typically paid to review products, the information they provide isn’t considered totally objective. As an alternative, TrustRadius members provide reviews without risking retribution from vendors or anyone else because they can protect their identities, said Bhagat, who founded Austin-based Convio Inc. in 1999. “There’s a level of authenticity that you can only get from users of products,” he said. Read more here. You'll need a subscription to access the full story. 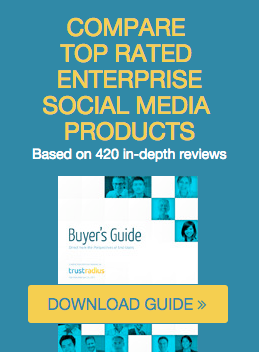 TrustRadius is the leading site for business software users to share real-world insights through in-depth reviews and networking. Our blog features original research, insights from real software users and interviews with industry leaders. © 2013 Trustradius. Powered by Blogger.